In the midst of global economic meltdown, parliamentary corruption and British constitutional mayhem, the first ever Anarchist Bookfair to be held in Cardiff opens its doors this Saturday 23rd May at 10am in Cathays Community Centre, 36 Cathays Terrace, CF24 4HX. As an example of anarchy in action, the event is free and is being organised by South Wales Anarchists, a network that takes direct action against capitalism and government. 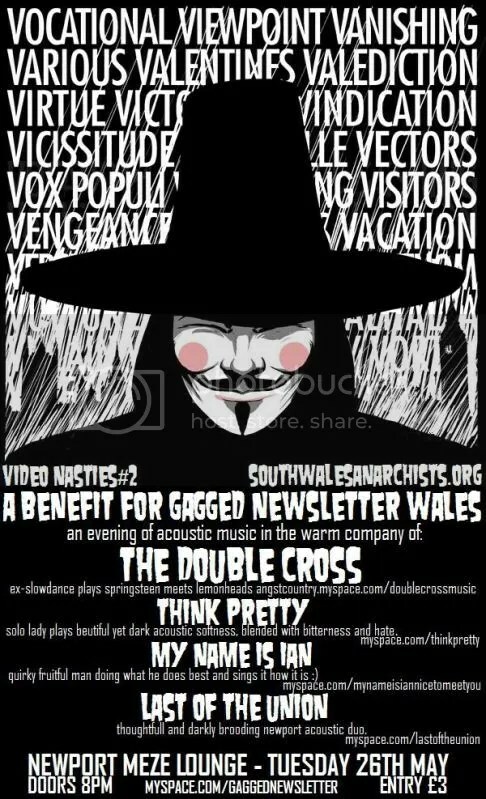 South Wales Anarchists have been involved in a range of local and national activities, as detailed in their regular newsletter Gagged!, and recent events in Westminster might suggest they have a point. 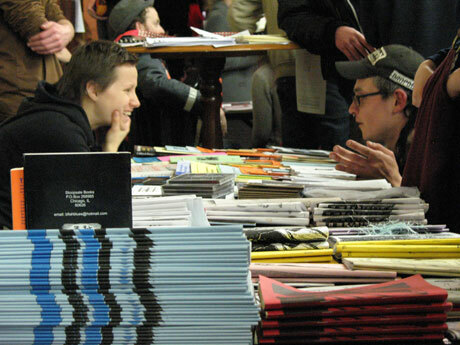 Anarchist Bookfairs have acted as the centre of anarchist organising and networking for decades, with thousands of people attending the London event every year. The recession has given anarchism a fresh impetus, with the black and red flag flying above occupied universities, schools and factories whilst summits across Europe attract increasing crowds demanding freedom and equality and an end to a world of oppression and profit. There will be a diverse range of stalls offering books, CDS, DVDs, badges,tshirts, free information and more. The day will include a full programme of talks and workshops. Some of the issues presented will include: how to build genuine community democracy, radical approaches to education, the case against border controls, why prisons should be abolished, how to get a computer for free and stay secret and how to turn the tables on the police who harass political activists. Food and refreshments will be available throughout the day which closes at 6pm. Children are welcome. The event will be rounded off with a ‘speakers corner’ open mic for any anarchist to air their views and a night of live music at Cathay’s Liberal Club from 7pm. Alun Cairns AM – once a banker always a banker? As allegations of corruption against Welsh MPs grow, perhaps it’s time they took a leaf out of Tory assembly member Alun Cairns’ book? First it was shadow Welsh secretary Cheryl Gillan’s squalid claim for pet food, then Stephen Crabb’s bill of £9,300 in reclaimed stamp duty, followed closely by Cardiff West MP Kevin Brennan’s claim of £450 for a TV and Paul Murphy’s £1,000 for TV and hi-fi system. Two other South Wales MPs have since added their names to the list of disgraced, but unrepentant Westminster politicians. Ex-Tory vicar Chris Bryant (below), Labour MP for the Rhondda since 2000, has trousered over £90,000 of taxpayers’ money to spend on properties in London and the Rhondda. Meanwhile, the sale of his West London flat in 2003 netted him a tidy (tax free) profit of £77,000, enabling him to buy another property worth £670,000. Madeleine Moon, Labour MP for Bridgend, has also allegedly had her snout in the trough. Despite strict rules to the contrary, she had furniture costing thousands of pounds delivered to Wales, while designating a London flat as her second home. Readers of South Wales Anarchists’ blog and sister publication, Gagged!, will certainly be familiar with former banker Alun Cairns, AM for South Wales West. Cairns infamously described Italians as ‘greasy wops’ during a radio programme. He was subsequently forced to resign as chair of trustees of the assembly members’ pension fund when we revealed that the £10 million pension pot is currently invested in some of the world’s worst polluters, while the assembly boasts of pursuing a green agenda. Nevertheless, even we were pleasantly surprised when Tory boss, Nick ‘iPod’ Bourne, proudly announced that from April this year Alun Cairns wouldn’t be claiming a penny of the £13,000 additional costs allowance to fund his second home in Cardiff Bay. A breath of fresh air amidst the stench of corruption, we wondered? Not a bit of it. Why Cairns should ever have been allowed to maintain a second home at taxpayers’ expense beggars belief. He lives in Ewenny in the Vale of Glamorgan, only 22 miles or 30 minutes by car from Cardiff Bay. Welsh assembly rules, however, allowed him to claim tens of thousands of pounds to spend on his Cardiff Bay flat because his home was deemed perversely to be in the Bridgend constituency. That was until 2006 when electoral boundary changes meant that Ewenny, once more, became part of the Vale of Glamorgan and Cairns’ gravy train came to a grinding halt. But rather than accept the change, he ‘lobbied’ members of the assembly house committee to get an exception to the new ruling and, in a secret meeting held in November 2006, the committee duly upheld his request. Nevertheless, could his decision to ‘sacrifice’ £13,000 be a genuine desire to send a message to the voters that, in stark contrast to the crooks in Westminster, he’s now a reformed politician? Thanks to the people at Video Nasties we’ve got a whole bunch of benefit gigs coming soon, all taking place on tuesday nights in the Meze Lounge, Newport and entry will only be £3. 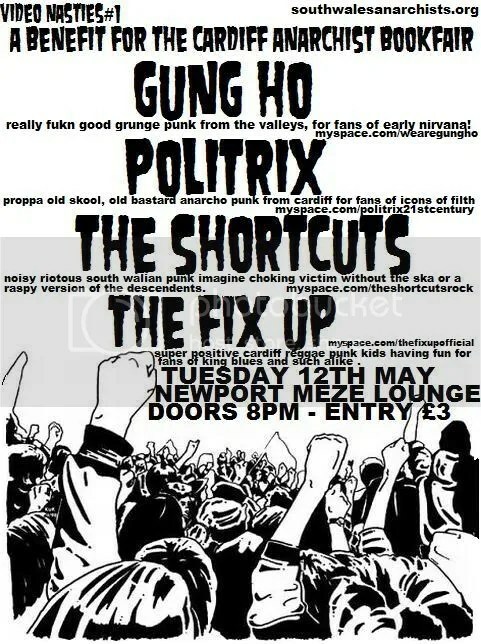 The first night on 12th May is a benefit for the Cardiff Anarchist Bookfair and with feature loud punk rock from Gung Ho, Politrix, the Shortcuts and the Fix Up. The second night on 26th May will be a benefit for our newsletter Gagged! and will feature acoustic music from The Double Cross, Think Pretty, My Name is Ian and Last of the Union. Hope to see loads of you all there! Issue 25 of our newsletter is out now! featuring articles on Stop and Search, ID Cards, Greek uprising, the DNA database, police corruption and brutality, protests, dodgy deals and more! As well as our own input we have contributions from No Borders South Wales, Cardiff Anarchist Black Cross and Westside Climate Action – if you want to see a story in Gagged! just get in touch! The next meeting of South Wales Anarchists will be held in the Model Inn, Quay St, Cardiff, at 7.30pm on Monday 20th October. In the upstairs bit.